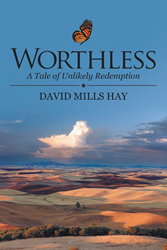 Spanning three decades and set in eastern Washington, David Mills Hay’s novel “Worthless” follows Jason Knightbridge’s rocky road to redemption, as he goes from rags to riches to rags again — finally culminating in a rather unlikely fate. An athletic dynamo and naturally talented winemaker, Jason ascends to stratospheric heights within the Walla Walla Valley. But years of selfishness and self-adulation leaves a scorched trail of broken relationships. When Jason loses everything — both by misfortune and his own self-destructive tendencies — he wonders if the label his mother slapped on him long ago was right the whole time: Worthless. Only when he’s seemingly lost everything, Jason discovers rock bottom isn’t truly a dead end. An old friend, one troubled teenager, and a brush with the unexplainable propel him onto the path to redemption. David Mills Hay has been involved in the investment business for nearly forty years. After lengthy stints at two Wall Street firms, he purchased a majority interest in Evergreen Capital in 2002. He is currently Evergreen’s chief investment officer and primary author of its widely-circulated newsletter, the Evergreen Virtual Advisor. David and his wife, Mindy, have two sons, six grandchildren, and an American bulldog. They live in Bellevue, Washington.